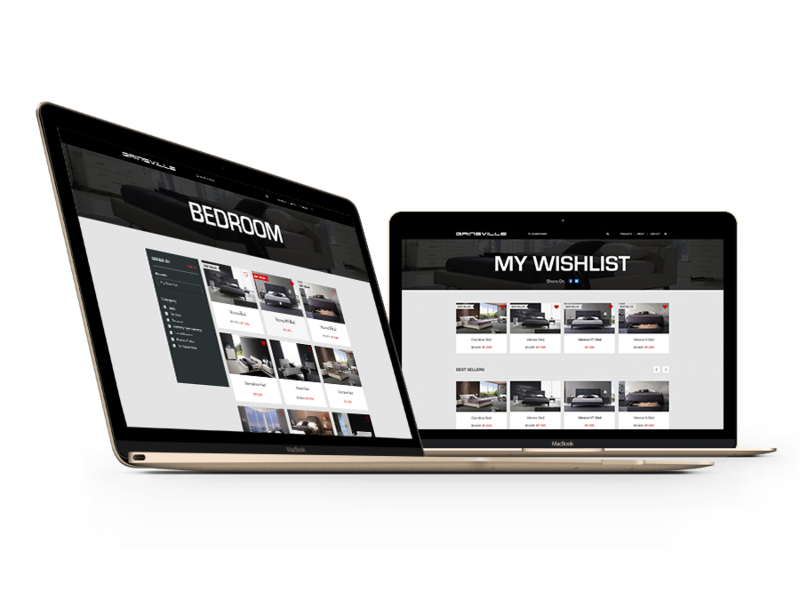 A Melbourne grown furniture store, Gainsville approached our team to reimagine their existing eCommerce site. In line with their brand, the new site needed to convey a seamless expression of class and good taste while combining decor, architecture knowledge and fashionable living. Our objective was to craft a site that lets users build an order online to request a custom quote for delivery. Gainsville are one of our long term partners in digital business growth. Already undertaking a range of digital marketing activities – SEO, SEM and social media – it was six years since their last website overhaul and again time to bring their site up to date with the needs of today’s ever-demanding consumers. We began with a comprehensive business analysis to flesh out the project scope and to solidify our teams understanding of Gainsville’s vision, goals, opportunities and business trajectory. From here we moved into interactive wireframing, UI design and frontend development. For the administrative backend our development team crafted a robust CMS that included plugin and module customisation while smoke testing/functional testing, extensive quality assurance and user acceptance testing ensured the final product was bug free. The final touch included integrated SEO strategies to ensure a smooth and successful launch. In order to attract product sales, product sites must be clear and easy for users to navigate. Behind the curtains they require slick and seamless integrations and customised technologies that make managing catalogues, quotations and deliveries a pain free experience. The complete overhaul of design and UX was targeted around delivering a supreme online quoting experience. Behind the scenes, the site was developed with a powerful administrative backend so that their team could easily manage and maintain all facets of the ordering and fulfilment of products. The end result is an online sales-driven hub, seamlessly connecting key systems while conveying a clear and compelling brand that is ready to generate leads and sales enquiries. The marketing and development team worked together to ensure all active ongoing marketing transitioned without a hiccup, while our in-depth SEO strategy was transferred and strengthened during the launch. The projects true strength lies in balancing brand positioning, online ordering and marketing for greater user engagement that draws in the right audience and boosts conversion rates. Gainsville’s users were quick to positively respond to the refresh while internally, the team were well equipped to manage and handle the influx of sales and leads. We had several goals we wanted to achieve when bringing on Newpath Web to create our new website and repair our Search Engine Optimisation campaigns. Our number one goal was to achieve an increase in sales, for this to happen two factors needed to be improved – the removal of any obstacles or barriers for potential clients to experience the Gainsville range, meaning the site had to work across all platforms including desktop, tablets and smart phones.The second factor was we needed to be found. Predominately our traffic was as a result of traditional marketing – television and newspapers. Newpath Web delivered us an amazing new website that has a great look and feel, is easy to use and one that we now receive plenty of positive feedback about. And through the efforts of Newpath Web’s SEO skills, we are now seeing great search results and making sales somewhere we haven’t previously been able to – from our website. Having our site appear in search results could be the difference between us making the sale or our competitors.